The hottest selling R&B album in the nation currently belongs to…Mariah Carey. No, it’s not the 1990s it’s the 2010s and Carey still matters. Carey has spent a lot of time perched at the top of the charts but at 48 she’s defying the typical music industry logic. Her determination to remain an active recording and touring artist is quite remarkable considering all the sexist and ageist rhetoric that relegates women over 40 to the has-been heap. 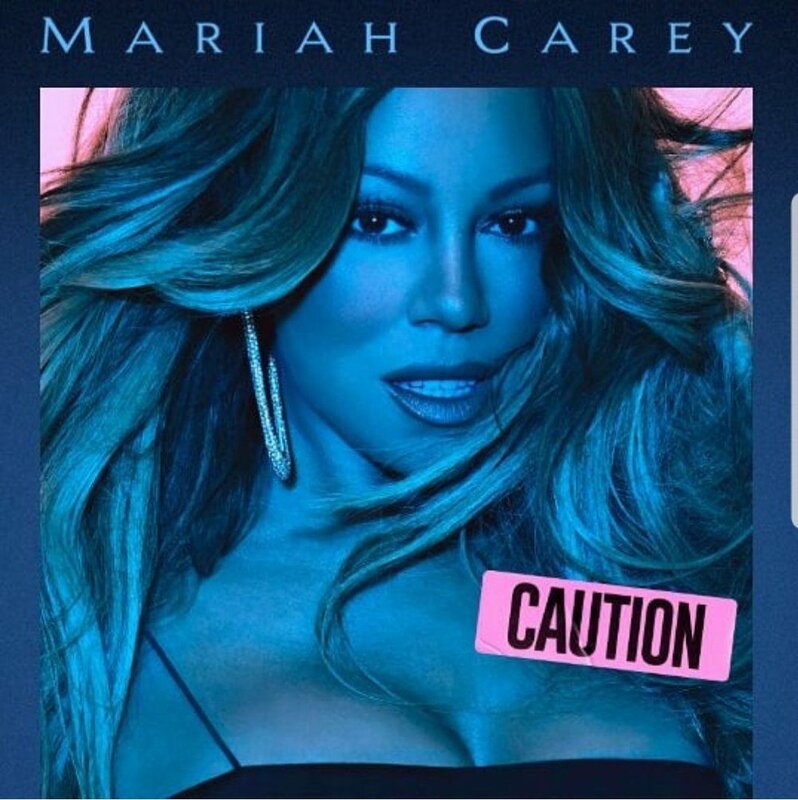 Mariah Carey’s 2018 album Caution is an acclaimed and popular set that has garnered favorable reviews and healthy sales. Almost 30 years ago, when Carey first rose to prominence, the industry measured success by multiplatinum album sales, propelled by multiplatinum singles launched by traditional delivery systems—music videos, radio and select promotional appearances. If her newest album Caution goes gold or has a single radio “hit” even her harshest critics would consider her truly back in the game. This may seem odd, but it tells you a lot about an industry that eats its young after they age and has struggled to avoid obsolescence. After decades of overcharging for CDs the digital revolution has altered the consumer landscape. Few artists are selling albums that go gold or platinum. How did we reach such low expectations for impact? Around the time Carey experienced a generation gap (end of the 1990s) young people were discovering Napster and hip-hop was growing more insular. By 2001’s ill-fated release Glitter radio was more consolidated, and the short-lived teen pop and Latin pop bubbles were growing increasingly tired. Just as Carey’s status of as the queen of 1990s pop seemed destined for other singers, she nearly fulfilled the prediction with the underwritten, overproduced and fussy Charmbracelet. The MC comeback trail actually began with 2005’s The Emancipation of Mimi. MC changed her aesthetic to leaner, more groove- oriented material and brilliantly synthesized elements of contemporary hip-hop and neo-soul without surrendering her almost baroque vocal style. This happy balance generated four genuine hits and earned her newfound respect in the modern R&B world. Frankly, in terms of female vocal icons R& had few contemporary heroes left besides Carey, Mary J. Blige and the slightly younger Erykah Badu. Though 15 years into Carey’s career was only a ripple compared to Streisand, Franklin, LaBelle, Warwick, Ross, Turner and other veteran vocalists, rare was the ‘90s pop star who thrived in the mid-2000s. Despite the increasing defragmentation in pop music—including the emergence of streaming services, the growth of YouTube and the nichification of pop (which deepened the adult and teen listening divides) 2008’s E=MC2 was a hit. It debuted at #1 and spawned a #1 pop single. Since then, the hits have been less fewer, but the albums have grown more distinct. Memoirs, Elusive, the new Caution and even Merry Xmas II You are distinctly Carey. She remade herself into a persona—that of the maturing star who is gleefully adolescent at times and expects to be understood as a survivor/veteran/legend. Distractions like the reality show or even public fiascos like the New Year’s Eve lip syncing debacle never fully erase her primary public identity as a recording artist whose best ideas typically emerge in recording studios rather than film studios or tv soundstages. In the era of “branding” certain moves solidify her brand as that of an idiosyncratic human, in stark contrast to the polished and well-behaved Carey of the early 1990s. 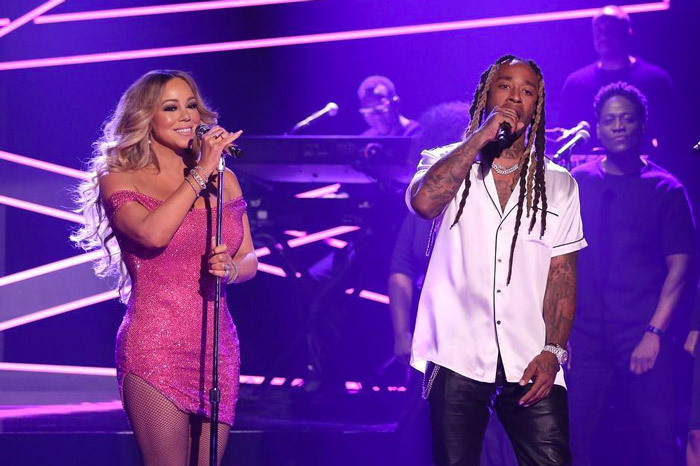 Carey and Ty Dolla Sign perform “The Distance” on The Tonight Show with Jimmy Fallon in November 2018. In the mid-1990s Carey pioneered the R&B and hop-hop fusion that persists today. Caution makes the case for Carey as comfortably accomplished by lowering the keys, scaling down the production and aiming for a more casual listening experience. Upon first listening few cuts will grab you the way hook driven pop music does typically. Rather, the record insinuates itself into your consciousness gradually. After listening a few times, you will find certain melodic fragments, rhythmic phrases, vocal passages and lyrics reverberate. It’s an unusually subtle element we do not usually associate with pop-soul divas. Everything is tightly produced—whereas before her vocal runs and the burnished production made every sentiment crystal clear, here she whisper-sings and phrases seductively with a laser sharp consistency. For most of the album you must listen closely to understand and unpack what she’s saying. Despite the title of her last album the diva here is elusive. For once, you as a listener must do a little work to understand what have become increasingly personal blues. Critics have attributed all kinds of subtexts to her lyrics; whether this speculation is accurate is less notable than the fact that Carey has enough of a life and presence for there to be subtext. In 1990, Carey was one of many mainstream voices competing for attention including Paula Abdul, Anita Baker, Michael Bolton, Taylor Dayne, Gloria Estefan, MC Hammer, Janet Jackson, Madonna, and Vanessa Williams among others. Several of these artists periodically release music on major record labels, but most have branched into other ventures, retired or faded from the mainstream. Understood in this light, Carey’s ability to stay current and yet still be her own artist is remarkable. Caution debuted at #1 on Billboard’s R&B albums chart, #1 on the separate Hip-Hop albums chart, and #5 on the Pop albums chart. Once again Mariah is on top.